Since its inception in 2002, Blue Waters has brought some of the biggest names in bluegrass music to the Inland Northwest, including The Seldom Scene, Dan Tyminski, the Steep Canyon Rangers, Della Mae, Laurie Lewis & Tom Rozum, Rob Ickes & Trey Hensley, Darrell Scott, The Lonely Heartstring Band, Kathy Kallick, Chatham County Line, Front Country, Jody Stecher & Kate Brislin, Mountain Heart, Crooked Still, The Infamous Stringdusters, Kenny & Amanda Smith, John Reischman & the Jaybirds, the Greencards, Martha Scanlan, Dirk Powell, the Josh Williams Band, and many, many others. Blue Waters is a 501(c)-3 nonprofit organization run entirely by volunteers. Our budget is small and depends heavily on the contributions of sponsors and individuals. By becoming a "Friend of the Festival" you can help us keep the cost affordable for other festival-goers and the entertainment quality high for future festivals. Just click the button below to get started. Respect for honest labor is a central theme in Wood & Wire's 2018 GRAMMY Nominated album, North of Despair. These are songs populated by people like songwriter Tony Kamel’s own grandfather, who built the family’s hunting lodge in Llano, Texas with his own two hands. The characters on the album live large, and aren’t afraid to share their opinions about the modern world. This kind of vivid, haunting songwriting focused on lives spent deep in the countryside is a hallmark of Texas songwriting. But it’s the melding of this hard country songwriting with high-octane bluegrass instrumentation that makes for Wood & Wire’s signature sound. Artists like John Hartford have trod this ground before, mixing up great songs, bluegrass virtuosity, and a strong sense of place, and Wood & Wire aim to pave the way for Austin’s roots scene, bursting out of the giant expanses of the state with a fully-fledged vision for a new Texan sound. On North of Despair, they bring the ferocity of their live shows to the studio, whipping through barn-burning anthems about hard people in hard times. Many folks remember the great bluegrass records from the 1950s and ‘60s. The power and soul of that music has won the hearts of people across the globe. Few bands have come along in recent years that directly draw their influence from that classic era of the music’s history. High Fidelity is a rising group whose love and devotion to that music is unsurpassed. The name alone says it all: HIGH FIDELITY. How many record albums have you seen from the ‘50s and ‘60s that bear those words? Herein lies the heart of what this group of young performers is all about. 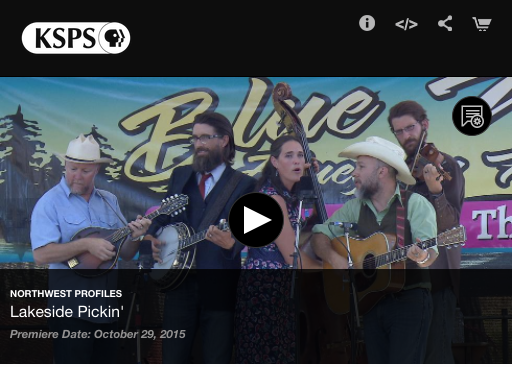 High Fidelity formed in early 2014, and they received their first achievement in February 2014 when they took first place in the International Band Championship at the 40th Annual Society for the Preservation of Bluegrass Music of America (SPBGMA) Awards. Their brand new debut record, which was recorded live and in one room with minimal isolation, has been critically acclaimed. A new and enchanting sound has emerged from the hotbed of the Colorado roots music scene. Masontown, a young band with a concept as timeless as the Rocky Mountains, has alighted onto a bluegrass community that has already produced some of the best that the acoustic music world has to offer. At once fresh and familiar, the group unites the sounds of bluegrass, old-time, folk, and new acoustic music into a sonic melting pot that hearkens back to our deep musical traditions while remaining defiantly modern in conception. Echoes of the poignant exploration of the Matt Flinner Trio blend with the fierce drive of Bill Monroe and the plaintive song-craft of Cahalen Morrison and Eli West. It’s no surprise that the members of Masontown have shared the stage with many of these musical icons that their sound evokes. Celebrated folksinger, songwriter and multi-instrumentalist, Ashleigh Caudill, has a sense of style that is unique and beyond categorization. Her songs are constructed with an architect's touch and her performances hum with an excitement in the crisp arrangements that lift each song. Growing up in a small town in Western Colorado Ashleigh began playing music at an early age. Upon receiving a scholarship to the prestigious Berklee College Of Music she relocated to Boston, Massachusetts, and then to Nashville, Tennessee where she has been an in demand hired hand playing with artists ranging from bluegrass icon, Charlie Sizemore, to Angaleena Presley of The Pistol Annies. A respected songwriter, Caudill placed in the finals of Merlfest's Chris Austin Songwriting Contest two years in a row. One of her songs, "Row By Row", was recorded on Balsam Range's IBMA album of the year, Papertown, and topped the Bluegrass Gospel Charts summer 2013 in addition to being nominated for IBMA's Gospel Recorded Event Of The Year. Based in Portland, OR and Seattle, WA, Whiskey Deaf is a bit of a Northwest "supergroup" composed of five of the region's most talented bluegrass musicians. Annie Staninec on fiddle is a long-time member of the Kathy Kallick Band, and she has also toured with David Grisman & the Gypsy Caravan, Darol Anger's Republic of Strings, and numerous other regional groups. Ethan Lawton is a founding member of the acclaimed country band Western Centuries, and has also toured as part of Zoe Muth & the Lost High Rollers. Jamie Blair is a lightning-fingered and innovative banjo player, who has performed and recorded with numerous bands since including the Ohop Valley Boys, Cascade Mountain Boys, String Theory and others. John Kael has been teaching and performing bluegrass guitar, mandolin, banjo and bass for over 20 years, and is also an established songwriter – his award-winning song Handmade Cross can be heard on the Grammy-nominated album “Hard Game of Love” by Doyle Lawson. Dee Johnson has been a staple in the northwest bluegrass scene, and is the rhythmic rock at the center of several great bands over the last two decades. Americana quartet True North is emerging as a Pacific Northwest powerhouse of intelligent, memorable songs, and lush instrumental and vocal performances, with the crazy-good picking and harmonies of a band deeply rooted in traditional folk and bluegrass genres. Fronted by award-winning singer-songwriters Kristen Grainger and Dan Wetzel, True North is rounded out with two Pacific Northwest bluegrass superstars Martin Stevens and Josh Adkins. Grainger is making a name for herself in songcraft, collecting accolades and awards at Wilflower! Arts and Music Festival, IMEA, Telluride, Merlefest, and Kerrville songwriting competitions. The band’s newest project, Open Road, Broken Heart, after receiving great reviews, debuted at number 1 on the Folk DJ Charts for national radio airplay. Greg and Caridwen Spatz have been playing music together since first meeting in 2000 as instructors at the British Columbia Bluegrass Workshop in Sorrento BC. Founding, core members of the celebrated Washington State acoustic world-music quartet Mighty Squirrel, they are known as well for their stellar, individual fiddle work with the ever popular bands John Reischman and the Jaybirds (Greg) and Prairie Flyer (Caridwen). Greg is also an acclaimed novelist, and in 2011 he was named Individual Artist of the Year by the Spokane Arts Commission. In 2018 Greg & Caridwen released their first duo project, All Along the Sea. Bitter Oak is a trio of bluegrass- and Americana-playing cousins from the Inland Northwest. Their extended family heritage has turned out numerous fiddle champions at all levels, as well as such critically-acclaimed (and grammy-nomiated) bands as Milk Drive and Della Mae, with whom they have shared the stage! The High Valley Mountain Boys were born out of a regular jam among friends. Sam Saxton (vocals, guitar), Dave Lorang (vocals, bass), Sam Lyman (vocals, mandolin), and Daniel Burdett (banjo) first began playing together in 2012. 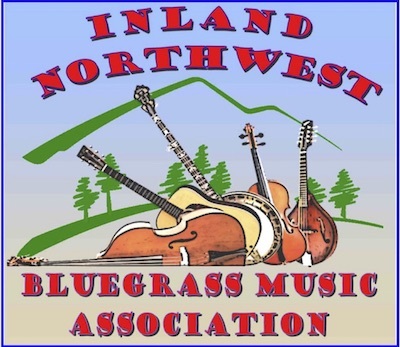 An invitation to play at the Inland Northwest Bluegrass Music Association monthly showcase encouraged them to move beyond jamming and put together a set list of songs that they’ve played more than once. You’re as likely to hear them play a Grateful Dead song as you are an Earl Scruggs banjo tune. The High Valley Mountain Boys can be found jamming at the Tamarack Public House every second and fourth Tuesday night from 6:30-9pm. Sign up at the front gate on Friday after noon. 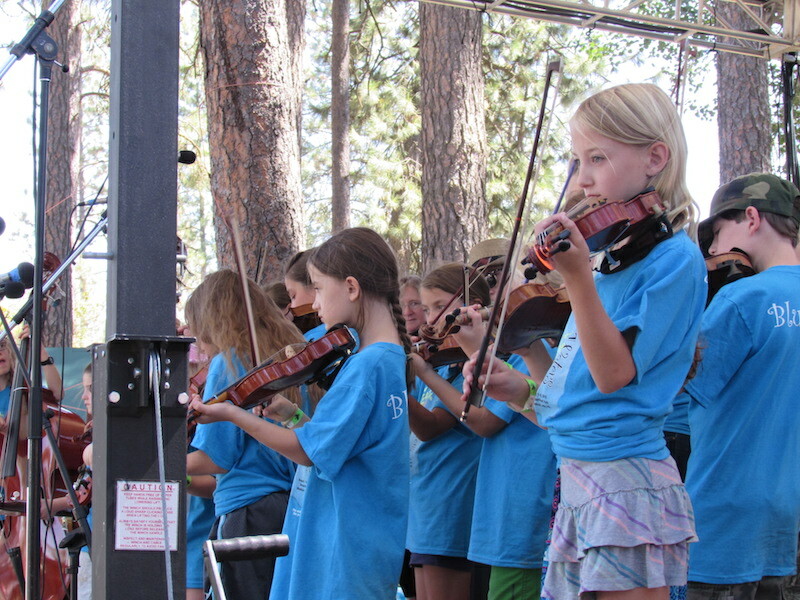 Under the able leadership of legendary fiddle instructor Jaydean Ludiker, "Blue Camp" is a two day music workshop offered by the Blue Waters Bluegrass Festival to youth ages 20 and under, regardless of musical ability. Students on any of the standard bluegrass instruments -- guitar, banjo, mandolin, fiddle and bass -- are welcome. Over the course of the two days the students will be instructed on some basic tunes and bluegrass jamming conventions and etiquette. Blue Camp culminates with an onstage showcase opportunity. Participants work with top notch, inspiring bluegrass musicians who give them something new and exciting to take away from their experience. 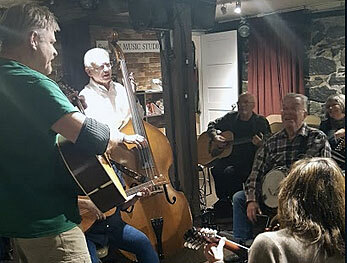 The Wernick Method Jam Class is an opportunity for pickers of all levels to improve their skills using a proven, hands-on teaching method created by bluegrass legend Pete Wernick of the band Hot Rize. Pete's method has been shared with instructors all across the world, and we are proud to offer a Wernick Method class at Blue Waters, taught by Spokane's own Kelly Bogan. More information about the Wernick Jam Class is available by clicking here. Volunteers are an essential part of the Blue Waters Bluegrass Festival. We are so fortunate to have a large group of generous, enthusiastic, friendly, and hard working volunteers. 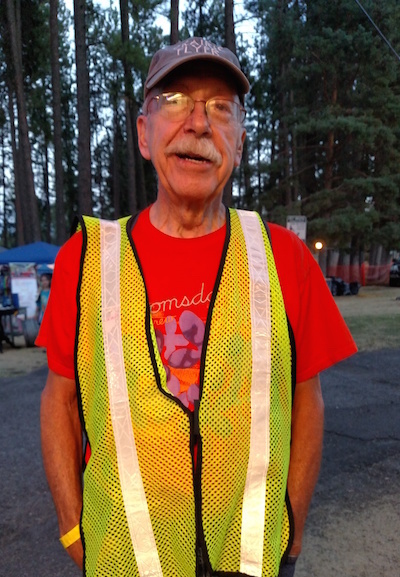 The volunteers are the first to greet visitors when they arrive, and set the tone for a fun filled weekend. Weekend camping passes are only $40, and are available online or at the festival gate. Please note that a weekend festival pass is required of all campers. Upper camping - RVs only. Dry camping -- there are no RV hookups or services available. Lower camping - Tents only. Absolutely no campers, popups, etc. will be allowed in the lower parking lot or camping area. This is a city mandate which is out of our control. Additional camping is available a short drive away at Ruby's on Silver Lake (509) 299-RUBY, and at Sun Cove Resort on Clear Lake (509) 216-6776. 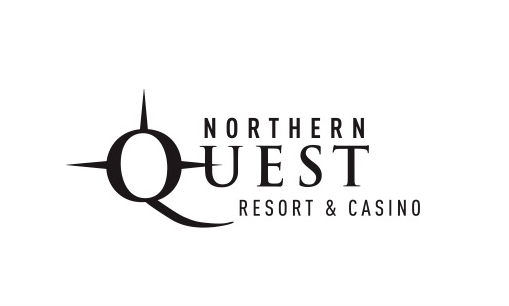 For those out-of-town guests who are not interested in camping, there are several quality hotels within a short drive of the festival. We encourage you to check out the establishments below. Several of these hotels have become friends and sponsors of our festival and we can wholeheartedly recommend their establishments. Pets are not allowed in the park where the music is held. Pets may be on a leash in the upper parking lot only, and on the walkway around the lake. Glass bottles are not allowed in the park. You are welcome to bring your own picnic food, although we also have plenty of food vendors. There are picnic tables available near the back of the viewing area. Bring your own blankets and/or chairs for festival seating, but please do not bring high-back chairs or umbrellas or anything that might restrict the viewing of folks behind you. Children under 12 are free with their parents. Medical Lake, WA is located just west of Spokane, WA. Waterfront Park is on State Highway 902 just south of Medical Lake, WA, about 15 minutes west of Spokane, and about 3 1/2 hours east of Seattle. The park is enclosed by a canopy of tall ponderosa pines, providing cool shade for those warm and sunny Eastern Washington days. Note to Travelers: The Spokane-Medical Lake area is on the dry side of the Cascades. A national magazine rated Spokane's summer climate as second best in the nation. Days are normally dry with temperatures in the 80's or low 90's. Nights are cool and you might need a light sweater for late jamming. On 1-90 Take Exit #272 nine miles west of Spokane. Turn right onto W. Medical Lake Rd. / Hwy 902 and continue for 5.6 miles into the town of Medical Lake. Turn left at Lefevre (right by Denny's Harvest Foods) and follow for 1.5 miles to Waterfront Park. The park and festival entrance will be on your right. On I-90 take exit #264 (Salnave Rd.) and follow Salnave / Hwy 902 north for 5.1 miles. Turn left into Waterfront Park one mile south of Medical Lake. Northbound and southbound travelers should get onto I-90 and head East or West as the case may be and take the appropriate exit indicated above. Additional offsite parking is available at West Medical Lake, which is just west of Waterfront Park. Watch for additional parking signs as you near the park from either direction.